There are plenty of sites that Kodi can stream movies from, but what if you want to download movies and keep them forever? This article will explore how to download movies on Kodi legally and safely. 2 Why download movies on Kodi? From there, your video will download to the location of your choice. We’ll explore more in detail about the process, as well as which addons you can count on to allow you to download movies consistently. Why download movies on Kodi? The catalog of streaming sites are always changing, and movies you come to love today may not be available from the same site in the future. In addition, you may sometimes want to watch a movie in a place where there is no Internet, making downloading a necessity. And if you tend to love watching a movie over and over again, you can save data by downloading the movie instead of streaming it every time. Since HD movies can use up 1-3 GB an hour while streaming, saving on data is an especially important point for many consumers. Most streaming sites do not allow downloads, so some users turn to peer-to-peer networks to try to find unofficial copies that can be downloaded. This can cause users all kinds of problems, including malware and other threats to privacy and security. So where can you go to find legal and safe movie downloads? See also: Is Kodi legal? Kodi is a free software media player from the Kodi Foundation. It will play many different video file formats, including MPEG 4, MJPEG, RealVideo, WMV, and more. It can also stream video from websites using apps called “addons.” Kodi can be installed on Windows, Mac OSX, Android, iOS, Linux, and popular TV devices like the Amazon Fire Stick, Nvidia Shield, and Apple TV. Whenever you download movies to play on your Kodi, you should always use a virtual private network (VPN) to protect your privacy and security. Both ISPs and addons can cause a risk to Kodi users. Thanks to the loss of Net Neutrality laws, your ISP can scan your internet traffic, collect the data, and sell it or give it away to those who ask for it. Meanwhile, both third-party and even official Kodi addons can be hacked to install malware, such as DDoS and cryptocurrency coin miners. Both have happened in the past, and unfortunately, Kodi users often don’t know they’re infected until well after the fact. A good VPN can protect your data from getting hijacked by both your ISP and hackers. In addition, VPNs help to protect users against man-in-the-middle attacks can unlock geographic content blocks put up by streaming sites. For these reasons, we at Comparitech recommend IPVanishIPVanish for Kodi users. IPVanish has apps for Amazon Fire TV devices and Nvidia Shield, has servers in over 60 countries, streamed 1080p video with no buffering in our tests, and keeps no logs. Additionally, based on recent malware attacks on Kodi users, we recommend all Kodi users install and run a virus scan to ensure their systems are safe. READER DEAL: Save up to 60% IPVanish plans here. Some Kodi addons claim to allow downloading of movies from within Kodi’s interface, without having to use a web browser or any other external software. However, there is only one Kodi addon that streams from legal sources in which we’ve found this feature to actually work: Black and White Movies from the MetalChris repository. We explain below how to use this addon to download movies. Later on, we also explain some alternative methods that will give you more options if you’re willing to use external software. 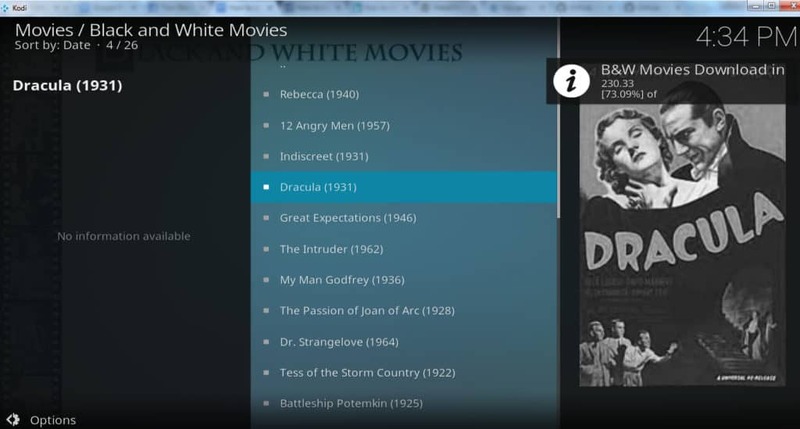 The Black and White Movies Kodi addon contains links to hundreds of classic movies in the public domain. It is officially part of the MetalChris repository. However, the zip file on the MetalChris github page doesn’t currently work, so the only way we’ve found to install this addon is to use the Indigo addon installer. To install Black and White Movies for Kodi, load Indigo and click addon installer → video addons → B →Black and White Movies → install. You’ll get a prompt that asks you if you’re sure you want to install both this addon and the repo it is a part of. Click yes to finish installing. If you don’t have Indigo yet, follow these instructions to install it. 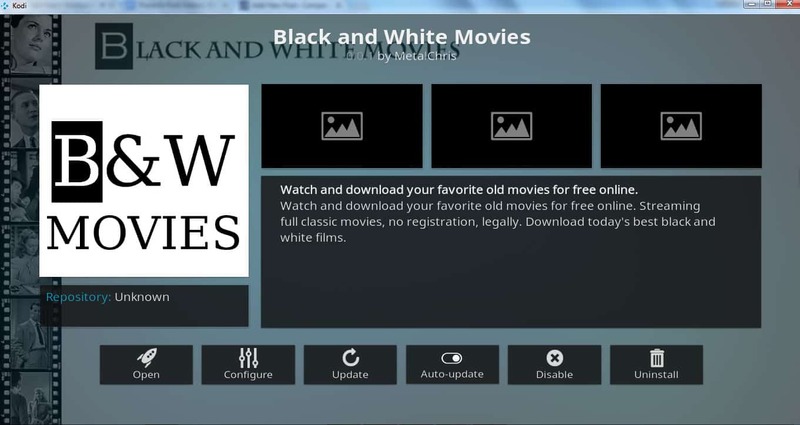 Once you’ve got Black and White Movies installed, open the addon and browse to the movie you want to download. 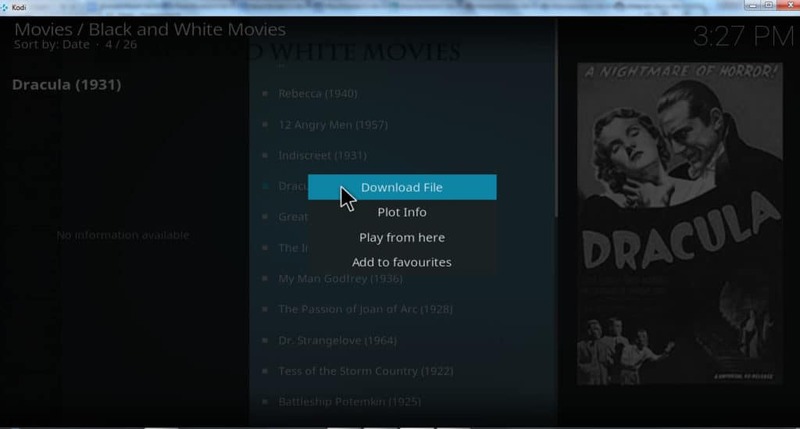 Right-click the movie and select download. This will open the settings menu of the addon. The first field at the top is for the download location. Click this entry and navigate to the folder you want to use to store your movies, then click OK. The slider that is second from the top (just below the download location field) is the display ongoing download status notification slider. Click this to slide it to the right. 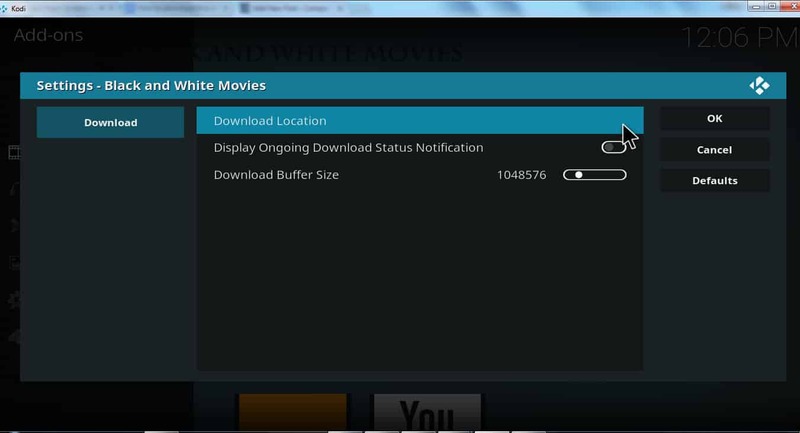 This will allow you to get notifications from Kodi as to the progress of your download. The third (bottom) setting is for download buffer size. We recommend sliding this all the way to the right. If this slider is too far to the left, your video will not download. Click OK to exit settings and begin your download. When you get ready to play your movie, navigate to the folder that contains it, right-click, and select open with → Kodi. Kodi will load and the video will begin to play. Since most Kodi addons do not allow downloads, you may want more options to find free, downloadable movies that you can play on it. Here are two options using a web browser. Free Classic Movies offers a wide variety of classic, public-domain films. This includes popular sci-fi, comedy, dramas, and other genres of film from the 1920s – 1960s. There should be two links. Right-click either of them and select open in new tab. When the video begins to play, click the download button in the lower-right corner of the screen. After the video finishes downloading, play it in Kodi by right-clicking and selecting open with → Kodi. The Internet Archive is mostly known for being a repository of old websites, but it also contains an extensive collection of public-domain films. There are over 400 sci-fi and horror films, more than 200 comedy films, and over 1,000 silent films on the site. To start downloading movies, go to the official movie subpage of the Internet Archive. Browse through the titles, which are sorted by type or genre. Click on a film to open its information page. Scroll down the page until you find a section titled “download options” on the right side of the page. Click whichever file-format you want. The movie will start playing. Click the download button in the lower-right corner of the screen. Once the video is downloaded, it can be played through Kodi by right-clicking the file and selecting open with → Kodi. The two previous sites offer completely free movies. But they only carry very old movies that have fallen into the public domain. So what can you do if you want to legally download newer movies that are still under copyright? This is where PlayOn comes in. PlayOn is a service that allows you to legally record movies and shows from many different free and premium streaming sites. These recordings are held on your device as a permanent file. You can move them to a different device, watch them in a place with no Internet, or even cancel the service that provided them and still watch them years in the future. PlayOn costs $30/year. In addition, you can only use PlayOn to record from a premium service if you also have a subscription to the service. You can sign up at the PlayOn official website. Once you’ve downloaded a movie using PlayOn, you can play it by right-clicking the title and selecting open with → Kodi or by opening the PlayOn recordings menu from the PlayOn Kodi addon and selecting the title. For a guide to installing and using the PlayOn Kodi addon, click here. Netflix carries one of the largest collections of movies and shows of any streaming site in the world. In addition to high-quality Netflix original films, it also carries blockbuster Hollywood movies that have only been out of the theaters for a year or two. A Netflix subscription costs between $8 and $14, depending on whether you want HD resolution and how many screens you want to be able to stream on simultaneously. There are usually a small number of Netflix titles that can’t be recorded through PlayOn due to licensing restrictions. For example, I found thirteen titles that cannot be recorded as of May 16, 2018, including Zootopia, Daredevil, Arthur, Jessica Jones, and a few others. However, these titles represent a tiny fraction of the total Netflix catalog. Aside from this restriction, Netflix is completely compatible with PlayOn. A Hulu subscription costs $7.99 per month if you’re willing to put up with limited commercials or $11.99 if you want to get rid of commercials entirely. The entire Hulu catalogue can be downloaded and kept forever using PlayOn. Once downloaded, its videos can be played through Kodi using the PlayOn Kodi addon or by right-clicking and selecting open with → Kodi. Note: IPVanish servers are blocked by Hulu. So if you watch a lot of Hulu content, we recommend using ExpressVPN instead. Today, HBO is well-known for its original series, such as Game of Thrones. But HBO is also still a great place to find movies that have only recently left theaters. There are over 400 feature films available on HBO’s streaming service, HBO NOW. All of them can be downloaded/recorded using PlayOn and played using Kodi. An HBO NOW subscription costs $14.99/month. In addition to these streaming sites, there are also many other sites with extensive movie collections that can be used with PlayOn, including Showtime Anytime, Max Go, PBS, Amazon Video, Crackle, and more. If you end up downloading a lot of movies, you may eventually reach a point where you get tired of having to right-click and select open with → Kodi every time you want to see a movie. If so, you can add all of your movies to a list within Kodi that will make it easy to find and play the particular title you are looking for. To do so, load Kodi and click videos → files → add videos… → browse, then navigate to the folder that contains the video. Once you’re in the correct folder, click OK, then click OK again. When the dialogue box titled “set content” appears, click this directory contains and select movies. Click OK twice again. Kodi will scan the folder and add all of the movies in it to a list for easy access later. Once this is done, you can find a particular movie by clicking videos → movies from the Kodi main menu. This will allow you to browse through your movies by genre, title, year, and other characteristics. When you find the title you are looking for, just click to start playing. We hope you’ve enjoyed this guide to downloading movies on Kodi legally and safely. For more information on how to find the best movies and shows using Kodi, check out our other Kodi guides, including the 114 best working Kodi addons, the six best Kodi addons for live TV, and the five best Kodi addons for sports.